WASHINGTON -- President Donald Trump abruptly announced late Friday he was appointing Homeland Security Secretary John Kelly to be his chief of staff, ending the tumultuous six-month tenure of Reince Priebus. 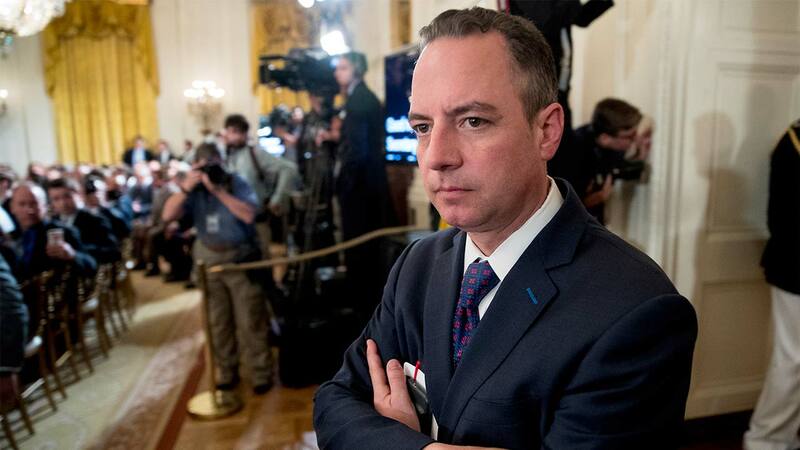 Priebus, the former Republican National Committee head, was the frequent target of rumors about his job security amid infighting and confusion within the White House and a long whisper campaign by Trump allies. Then, he was the subject of a remarkable public rebuke on Thursday by the new White House communications director. Secretary of Homeland Security John F. Kelly is replacing Reince Priebus as White House Chief of Staff. Speaking to reporters on the tarmac at Joint Base Andrews outside Washington, Trump said: "Reince is a good man. John Kelly will do a fantastic job." Priebus never could bring a semblance of order to the team of in-fighting rivals that populate Trump's West Wing, and questions about his future have long swirled around the office. Those questions sharply escalated this week with the arrival of Anthony Scaramucci, the hard-charging communications director who was hired over Priebus' objections. Priebus did not respond to reporters' shouted questions. His term ends in fewer than 200 days, the shortest tenure for any president's first White House chief of staff since the post was formally established in 1946. Priebus also was blamed by some within the White House for the failure of the Republican health care plan, with some Trump allies believing that Priebus' longtime relationships with Republicans on Capitol Hill should have ensured the bill's passage. Rather than return to the Republican National Committee, Priebus - a political operative and attorney - is expected to look for a corporate job or possibly write a book about his experience in the center of the Trump storm. Associated Press writers Catherine Lucey, Vivian Salama, Steve Peoples and Laurie Kellman contributed reporting.